Gluten is present in all forms of wheat and for Celiac disease sufferers, it can be a matter of life or death. Even those without a Celiac disease may have gluten sensitivities and follow a gluten-free regimen. Experts disagree on whether gluten sensitivity actually exists. One recent study at Monash University in Australia suggests that FODMAPS may actually be the culprit . FODMAPS is an acronym which stands for Fermentable Oligosaccharides, Disaccharides, Monosaccharides and Polyols. These sugar compounds are commonly found in many of the same foods containing gluten. While gluten may not be the ingredient causing stomach issues, going gluten-free may help eliminate the underlying effects. The New York Times reports that the number of households purchasing gluten-free food products has risen from 5% in 2010 to 11% in 2013. That amounts to about $10.5 billion in sales and that amount is expected to climb to $15 billion by 2016. The newly emerging condition causes many challenges for food producers. "Product quality and product innovation are the lifeblood of every branded consumer foods company." Companies researching and experimenting new formulas and processes for gluten-free product offerings may be eligible for federal and state R&D credits. In 2011, General Mills spent $235 million on R&D. The industry giant is attempting to carve out a niche in the gluten-free market after realizing that customer inquiries about food allergies largely centered on whether they contained gluten, says Ann Simonds, General Mills President of Baking Products. However, creating gluten-free foods requires careful production techniques throughout the manufacturing process. Testing for gluten is relatively simple; however creating a product that meets government specifications and consumer expectations requires more sophistication. As gluten-free products evolve, consumers are being more selective in their choosing. This demand creates a market were producers compete on nutrition, shelf-life length, taste, and most importantly texture, since gluten is what gives bread products consistency. The large food manufacturers have huge contingents of chemists, scientists, and nutritionists constantly seeking solutions. Hundreds of millions of dollars have been put into research and development efforts for gluten-free products. "At General Mills we are committed to continuous health improvements. We also know that food is absolutely not nutritious unless people are eating it. The win in innovation is in providing healthier products that are affordable and taste great." With some products the task is easy. For example, General Mills produced gluten-free Chex in 2008 by switching a few minor ingredients. However the Betty Crocker gluten-free brownies introduced in 2009 required a much more intricate formulation and procedure. This process included testing batch after batch over a thousand different times to achieve the desired result. "From a formulation standpoint, there is no single solution for replacing gluten," "Gluten has different functions in raw products such as bread dough versus the finished baked product." This requires intricate analysis of how to combine different ingredients in such a way to compensate for the lack of functionality normally provided by gluten. General Mills has reached out to the nation's top experts for medical advice and scientific guidance to improve the gluten-free product offerings. Their website specialist who administers the gluten-free site Glutenfreely.com has remarked that,"science needed to be front and center" This has enabled General Mills to create over 300 products with gluten-free labels including cereals, pancakes, and desserts. Anheuser-Busch introduced Redbridge, a gluten-free beer in 2006. Dunkin Donuts planned to release its gluten-free product line by the end of 2013 but pulled back the product line for further testing and development. "global network of specialized research and development and product technology centers which are continually researching and developing new products giving Nestle [their own] competitive advantage." 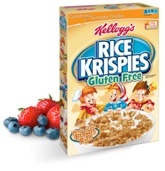 Kellogg's used its R&D center to create their mainstream product, gluten-free, Rice Krispies. General Mills responded with gluten-free Fruity and Cocoa Pebbles. As the market grows to an estimated $5 billion in 2015 from $2.6 billion in 2010, these industry giants are digging in their heels to establish a strong foothold in the gluten-free market. Still, they must erect separate facilities and each batch must be individually tested to make sure it is truly gluten-free. Otherwise they will not be entitled to brand their products with the gluten-free label. In August 2013, the FDA defined the meaning of "gluten-free". The new labeling requirement means that in order to put the stamp on packages, the food product must contain less than 20 parts per million of gluten. This improved product labeling will enhance consumer trust and confidence in gluten-free products. Many foods that were labeled as "gluten-free" before the regulation will need no additional tweaking. However, those producers which fall short must rely on their research and development teams to bring the product up to par by August 2014 or abandon the label. Emerging awareness of gluten sensitivity and intolerance creates challenges within the food industry. Companies should be aware of the federal and state R&D tax credits available to help shoulder the costs of innovative gluten-free product development.